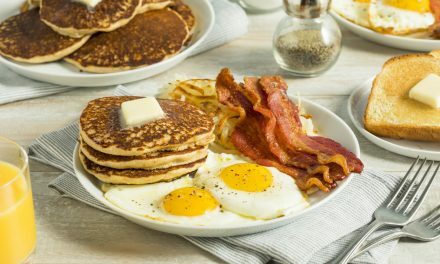 When you consider that 40% of American adults aren’t getting the recommended seven to nine hours of sleep per night and that 40% of the U.S. population is obese, it’s easy to see how there may be a connection. Here’s a look at how sleep affects your weight and why getting enough sleep for weight loss is important. Not getting enough sleep can make you feel ravenous which causes you to overeat and pack on the pounds. Studies show that people who get less than six hours of sleep per night are more likely to be obese. They’re also at greater risk of having sleep apnea, which constantly disrupts sleep during the night. Less sleep can wreak havoc with two hormones, ghrelin, and leptin. These two hormones have opposite jobs to do; ghrelin stimulates our appetite while leptin suppresses it. When you get less than the recommended amount of sleep, it sends your ghrelin levels into overdrive so you feel hungry. At the same time, leptin takes a dive so you’re unable to control your cravings. This hormone disruption is your body in survival mode; it wants you to eat more to help you stay awake throughout a busy workday. The problem is it’s a vicious cycle. 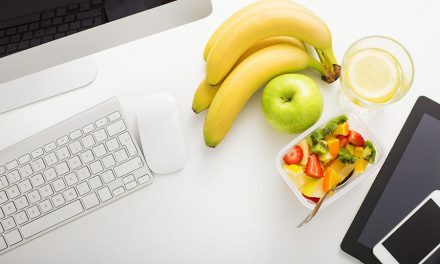 You’ll most likely crave carbohydrate and sugar-heavy goodies from the vending machine, particularly around 3 PM when you hit your afternoon slump. You’ll also skip your after-work gym session as you’re too tired to exercise. If you don’t hit the hay early enough that night, you’re setting yourself up to repeat the pattern the following day. Sugary fixes don’t boost energy for very long. They can actually make you feel worse when your blood sugar spikes and then plummets. Consuming coffee can make you unable to fall asleep later as caffeine’s full effects are usually not felt until six hours after consuming it. If you want to stop sabotaging yourself and craving food throughout the day from not getting enough zzzzzs, you’ll need to figure out how to go to bed earlier and get the amount of sleep you need. The energy you gain back will enable you to take lunchtime walks or tackle a workout when the workday is through. Fortunately, there are several steps you can take to fall asleep faster and improve the quality of your sleep so that you get the adequate rest you need. 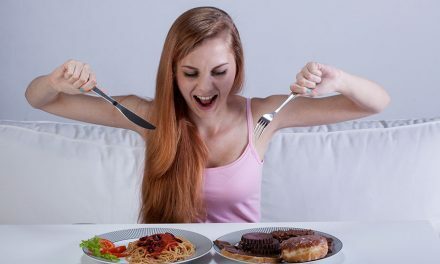 Here are some tips that can help stop the cycle of overeating to compensate for lost sleep. The most important first step to stopping sleep deprivation is to get to bed early enough, and on time, so that when your alarm goes off in the morning you’ll feel refreshed. This is easier said than done when you’re a parent or you have a lot of obligations. However, your health needs to come first so you can give the best of yourself to others and this starts with regular quality sleep. Try to get a bedtime routine established. Power down the mobile devices at least an hour before going to sleep (the light emitted from smartphones and tablets can disrupt our sleep cycle), give yourself a pampering session in the bathroom, brush and floss your teeth, and set out clothing for the next day. Finish any tasks you need to do early in the evening. De-stress by practicing some meditative breathing and clearing your mind of any worrying thoughts that can keep you awake. It may be difficult at first for your body to get used to the new schedule, but soon your mind will be anticipating and even craving the routine. A room that is too hot or too cold can prevent you from falling and staying asleep. Try to maintain a room temperature that’s between 60 and 67 degrees Fahrenheit to help your body temperature naturally drop to help you fall asleep. To prevent caffeine’s lingering effects from preventing you from falling asleep, don’t consume any food containing caffeine after 2 PM. You may also want to limit your amount of caffeinated beverages to four per day. Water helps with weight loss, so drink plenty of it throughout the day to feel hydrated and refreshed. And what about a nightcap or glass of wine to help you unwind and sleep better? You may want to proceed with caution. Alcohol is a depressant and while it may initially help you fall asleep, it often interrupts it later during the night. You should also eat your dinner at least two hours before bedtime so digestion doesn’t disrupt sleep. Avoid eating a full, heavy meal just before turning in. If you must nosh on something, make it a healthy snack such as a piece of fruit or cheese, or a handful of nuts. Cutting down your sugar intake during the day can actually improve your quality of sleep, and when you are getting enough sleep you’re less likely to reach for a doughnut or other sugar-laden snack. Once you’ve established your new sleeping routine and you feel your energy improving, you also want to exercise regularly. Exercise helps regulate our circadian rhythms, which keeps us more alert during the day and sleepy at night. A regular workout routine can take several weeks or even months before it truly positively affects our sleeping routine, so stick with it. After getting a great night’s rest, you may want to try becoming a morning workout person to get your day moving in the right direction. Exercising in the morning can help you consume fewer calories during the day and burn more fat in addition to helping you sleep better. Getting enough sleep requires a little effort and commitment. It’s worth it, however, when you have enough energy to sail through your day. You’ll also love how it keeps cravings to a minimum and helps you maintain a healthy weight. If you enjoyed this post on sleep for weight loss, we have plenty of other weight loss tips. Check out our latest weight loss posts to learn more! NextUnderstanding the Hair Growth Cycle and How Even Women Can Lose Their Hair!